Drum corps fans will have exciting opportunities this week in the southern United States to learn just what it takes to be a part of Marching Music's Major League! Hosted as part of select Drum Corps International Tour events, Live Learning Events give drum corps fans an interactive inside look at the experience of rehearsing and marching as a member of a World Class drum corps. At these events, get up close to corps members and discover tricks of the trade to bring home with you. Learn from the performers and staff in all sections to see how they produce the excellent performances you see on the field. The following Live Learning Events are free with your ticket to the corresponding show. Purchase tickets to the DCI Southern Mississippi event. Purchase tickets to the DCI Arkansas event. Purchase tickets to the DCI Gadsden event. Purchase tickets to the Masters of the Summer Music Games. "Performance" at Blue Man Group goes beyond technical skill. Each performer must bring a core set of values to the work including the art of listening, commitment, open mindedness & versatility, dialog & conversation, support and trust. Join Blue Man and drum corps alumni Anthony Parrulli and Blue Man Group Music Director Jeff Quay for a discussion about the key concepts and values every Blue Man Group performer brings to nightly performances of the production around the world. 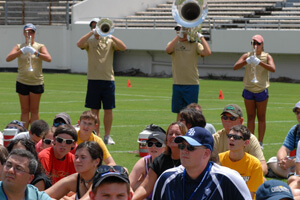 Purchase tickets to the DCI Orlando event.